MOORESVILLE, Indiana (February 20, 2018) – Three-peat is tough to beat. Equipment Technologies (ET) has been named a 2018 winner in the EquipmentWatch Highest Retained Value Awards program, the industry’s only award based on residual values for heavy equipment. The Apache 1000 Series sprayer received this honor as the model series calculated to retain the highest percentage of its original value after five years among all competitors in the self-propelled sprayer category. 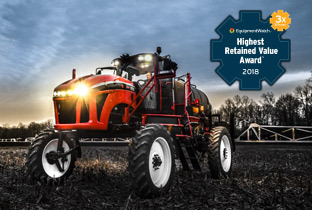 This is the 1000 Series sprayer’s third consecutive win for the award — ET is the only manufacturer that has achieved three wins within the sprayer category. Apache prides itself on producing high-quality sprayers with a rugged reliability at a fair price to keep resale values high and cost of ownership low. To name the 2018 Highest Retained Value Award winners, the EquipmentWatch analysts considered 12,000 models with up to 20 model years. EquipmentWatch then uses a proprietary algorithm to estimate residual values up to 84 months into the future. To learn more about the winning models and program methodology visit: www.equipmentwatch.com/methodology-highest-retained-value-awards/. Apache Sprayers creates simple, dependable, lightweight and affordable self-propelled sprayers for the everyday farmer. 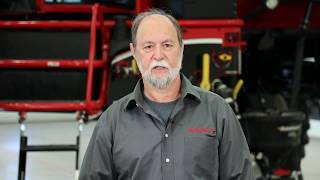 Every sprayer is manufactured in Mooresville, Indiana, by the Apache Sprayers parent company Equipment Technologies. 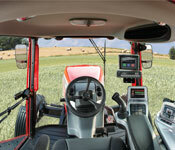 Apache Sprayers are distributed throughout the United States, Canada, Australia and C.I.S. Learn more about Apache Sprayers at apachesprayers.com.